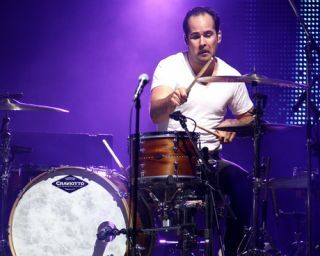 Ronnie Vannucci has had spoken out about the new Killers record. Take a gander below to see the drummer's big talk. Vannucci told NME: "The next album is going to have more guitars. It's about f***ing time!" He added that the Las Vegas synth pop rockers have a few guys in mind to produce when they head into the studio next month. Vanuncci said: "We have some people in mind, but I don't want to piss people off and say who it is. All last month we've been writing some great Killers songs, it's really happening. I'm really looking forward to doing this next record, it's going to sound f***ing great."